This fall, The King's College's traded Interregnum’s annual 30-minute reading test for a 12-hour long film competition. The change has been met with both opposition and enthusiasm. On a Friday night at 6 p.m., the first Interregnum Film Festival began. In between brainstorming, scripting and filming; students had plenty something to say about the Film Festival. A group of freshmen in the House of Queen Elizabeth I (QE1) looked with excited eyes to their Helmsman, Jennifer Ingrahm, as she entered classroom 633 accompanied by Olivia Stevers, the Houses’ Competition Associate. After two hours of brainstorming, writing and rewriting, they had the script, the script of QE1’s video submission for the first ever Interregnum Film Festival. The prompt this year focused on the theme of Order and Chaos, challenging students to create a film that showed a life that balanced these two contrasting topics. The House Scholar, Annabell Hutchinson looked about the classroom at her fellow Queens, ready for the new challenge they have before them. Addressing the room, Hutchinson thanked everyone for being there, then turned to the pair standing in front of the room. She thanked Ingrahm and Stevers for writing the script that will be the backbone of the house’s project and then sat down, making room for the scriptwriters to address the room. Ingrahm pulled up the script, beginning to excitedly explain both her vision and the script to the room full of girls. She paused. Little did they know, they would be crowned champions by the end. The mood is light but anxious eagerness rippled through the room. The script was ready, filming locations were selected, the film team gathered their coats and set out into the night. When the film team returned at 11:59 p.m., the editing team took over, creating a film out of the content they captured. The House of Margaret Thatcher discussing the Interregnum prompt. || Photo credit to Jolie Richardson. The stage is set for a long night. In years prior, the first Interregnum event was a graded reading test. This past weekend that changed. The test was replaced with a twelve-hour film festival, requiring all students at The King’s College to attend a lecture and mandatory film screening. “We knew pretty early on that we wanted to get rid of the reading test this year.” Paul (Hank) Jeannel, The Interregnum Committee Chair said. 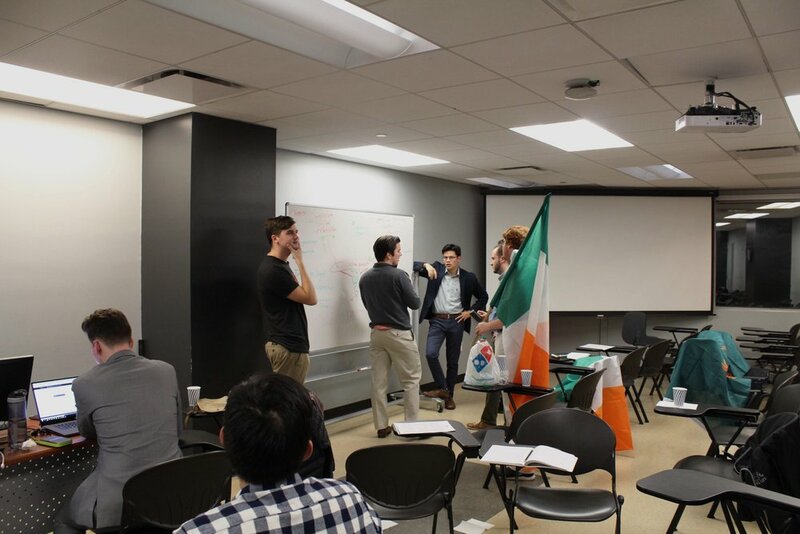 The process of finding a new competition to replace the old test was a long one that began with the committee finding a way to best interact with the theme and readings. The House of C.S. Lewis prepares for the Film Festival. Eddie Vanzandt is holding his iconic Irish flag. || Photo credit to Jolie Richardson. The move to introduce a new competition and eliminate an old one was met with some initial apprehension and confusion from the student body. The thought of a school-wide all-nighter, the potential lack of involvement, and the loss of the benefits of the test were the forefront concerns of upperclassmen and executive team members. “To be honest, the first time I heard it I was a little disappointed because I’m a scholar and I was looking forward to the reading test... Now that we’ve come so far I am excited,” scholar for the House of Thatcher, Cara Swain said. For many students who are competing and are more creatively inclined, this event was exciting, incentivizing participants to do the reading. But, did those who simply went to the required events do the reading? House of Susan B. Anthony strategize over their film idea. || Photo credit to Jolie Richardson. Another aspect of the limited time was that it takes the pressure off of executive team members to sacrifice too much time in preparation for the event and forces them to rely on the help and talents of people outside of their team. It cannot be completed by four people; it requires a network of involvement. However, there were some concerns about whether this new competition requires everyone to prepare. Some can see how the new arrangement allows for some people to be completely uninvolved in the competition aspect without penalty. “While there are fewer people involved, I think those people that are involved are definitely getting a lot more out of Interregnum than they were the first two years I was here,” Wagner said. House of Margaret Thatcher present their film. || Photo credit to Elli Esher. Brent Buterbaugh, freshman in the House of C.S. Lewis shared his thoughts on the Film Festival. By 6 a.m. on Saturday morning every house had submitted a video for the Film Festival. Later that day, each house submitted their own film critique of another houses’ film and the student body gathered on campus to watch the work of their housemates and classmates on the big screen. At 8:45 p.m., QE1 received first place, accepting the prized Oscar-style trophy as the competition’s winners. The Houses of Sojourner Truth and Margaret Thatcher would take second and third place and collect their own trophies. Popcorn littered the white linoleum floors, professors told jokes and people broke into a dance party. The upperclassman would recognize this energy from Interregnum in the spring and the underclassmen, on a high of house camaraderie and hard work, left school that night with a taste of what is to come. Earlier in the competition on Friday night, before the films were complete and the committee could relax in the success of the event, a sense of chaos had fallen over the school. Teams with iPhones and props ranging from cigarettes to dogs were scattered across the city. Some people stayed behind at school to keep hot coffee brewing and the energy level high. The House of Churchill paraded down the hallway, capturing a scene, then marched down the hallway when with frustration when it didn’t fit their vision. Fordyce started to walk back to the Interregnum Committee room but paused to take it all in. “I think the vibe of the film festival is what Interregnum is all about,” Fordyce concluded.